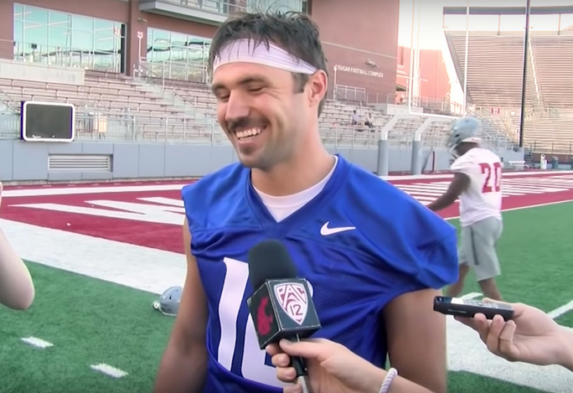 QB Gardner Minshew finished his remarkable, lone season at Washington State by throwing for 299 yards in the Cougs’ 28-26 win over Iowa State in the Alamo Bowl. Whether the result was bigger for Washington State or the Pac-12 Conference wasn’t readily apparent, but at least the Cougars don’t have to live with the Apple Cup outcome as the final memory for an otherwise splendid football season. QB Gardner Minshew delivered as he did nearly throughout his remarkable single season in the Palouse, completing 35 of 49 passes for 299 yards and two touchdowns, and ran for another as the 13th-ranked Cougars held off 24th-ranked Iowa State 28-26 (box) in the Alamo Bowl Friday night in San Antonio in front of 60,675 fans. The triumph for the Cougars — the 11th win was a school record — also was the Pac-12’s first win in the three bowl games so far, following losses by 7-6 Arizona State (Fresno State, 31-20) and 7-6 Cal (Texas Christian, 10-7 in OT). The league is desperate for a little sporting dignity after a 1-8 result in the previous year’s bowl season. The Cougars took great reward from a year that began in tragedy with the death by suicide of Tyler Hilinski, the heir apparent to the starting QB job held by the graduating Luke Falk. Many saw the Cougars as a four- or five-win team. But a defense led by sixth-year senior LB Peyton Pelluer complemented the abrupt mastery of coach Mike Leach’s Air Raid offense by Minshew, who became the Pac-12’s single-season leader in pass yardage and attempts, topping Cal’s Jared Goff, now leading the Los Angeles Rams. It was a Minshew shovel pass in the fourth quarter that proved pivotal in the Cougars’ fourth consecutive bowl game. Nearly trapped for a sack, Minshew flipped the ball to WR Tay Martin for a 20-yard gain to the Iowa State 10-yard line. RB Max Borghi scored on the next play — his 12th set a WSU freshman TD record — for a 28-20 lead. The Cyclones (8-5) came back to score on a one-yard run by QB Brock Purdy with 4:02 left. But the two-point conversion try was set back by a false-start penalty. Purdy then threw a short completion that was stopped well short of the end zone, where stood a wide-open ISU receiver. Purdy threw two first-quarter interceptions, and Iowa State had two defenders ejected in the first half because of targeting calls. Umm , well … I guess a 2 point win over #24 is something for the conference to hang their hat on . Better than O-fer anyway . Larry Scott is happily staffing the Crumbs Receiving Dept. Fun game to watch. As usual would have liked to have seen James William run the ball between the tackles more often but a nice win. Always better for the Cougs to play indoors. With respect to the interception when the Coog got called for taunting before scoring, negating the touchdown, I would have had him doing about 500 up-downs right there on the sideline. He deliberately tried to coog it but got saved by the offense instead. Leech never takes responsibility for his own failures, always blaming losses on others. It would be hypocritical of him to require accountability from his players.